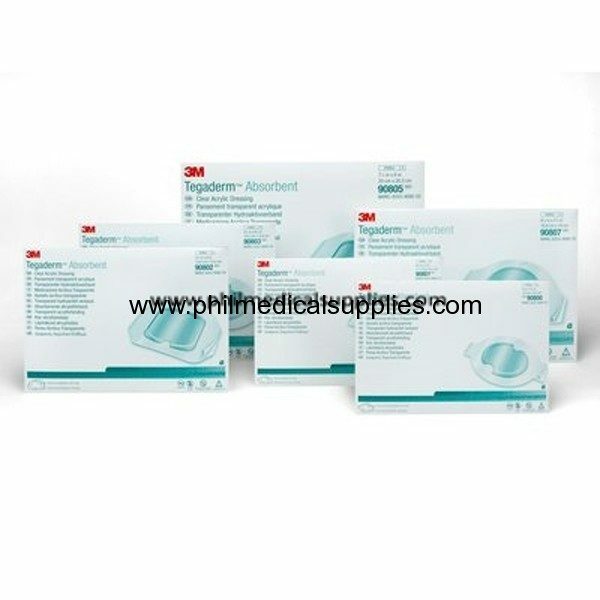 3M Tegaderm Transparent Film Dressing is a transparent film dressing used for many different applications. Providing a breathable bacterial barrier to outside contaminants as a primary or secondary dressing for Abrasions, skin tears, blisters, Skin graft donor sites, Superficial partial thickness burns, Stage I or II pressure ulcers, Autolytic debridement, Protective eye coverings, Skin protection against moisture as well as friction and Clean, closed surgical incisions. Tegadern transparent dressings may also be used to cover and secure I.V. devices such as Peripheral and midline venous catheters, Central venous catheters, Implanted infusion devices (ports), Dialysis catheters, Pulmonary artery catheters, Arterial catheters and Epidural catheters. Tegaderm Transparent Film Dressings come in variety of sizes and offer a unique “picture frame” or “first aid” delivery system which allows for a precise, secure placement of the transparent film dressing every time. Tegaderms breathable film characteristics provides a bacterial and viral barrier to outside contaminants.